In general, a pickup’s resistance reading is a good rough indication of its so-called “output” power, but that should always include the caveat “all else being equal.” There are many other factors influencing how “hot” a given pickup will sound in your guitar, and the raw resistance reading (given in Ohms) doesn’t always tell you that on its own. The type and strength of the magnets used, the gauge of wire that the pickup’s coil is (or coils are) wound with, the inductance of the pickup, and its general design and construction will all influence how hard any pickup drives your amp, as well as other characteristics of its sound. If you’re getting onto the pickup-swap merry-go-round bigtime, it’s worth reading up on these other factors before making snap decisions on purchases based on resistance specs alone. There are some great high-output pickups out there, and sometimes one of these is just the ticket for certain styles of music—heavy rock, metal, contemporary shred—but you don’t necessarily need a super-hot pickup to rock out. Consider, though, that even heavy metal was established in the late ’60s on original Gibson “PAF” and “Patent No.” humbuckers and P-90 single-coils, and none of these are “hot” pickups by today’s standards. Put another way, you don’t need a high-gain pickup to produce successful high-gain tones. Often a standard or “vintage-wind” pickup will allow greater dynamics and a deeper, richer tone, which you can inject into an overdrive, distortion, or fuzz pedal or a high-gain amp channel to produce all the scorch-and-burn you need, yet with a more musical tone and greater clarity than you might achieve with many super-hot pickups. More specifically, the way that any pickup’s design places the magnet—either within the coil acting as the pole pieces, or beneath the coil in contact with steel poles that are going through the coil—influences the pickup’s brightness and clarity. Relatively speaking, magnet-in-coil=brighter and clearer; magnet-beneath-coil=thicker and meatier (sometimes with a slightly granular edge). This is by no means a better-or-worse situation, but just another means of understanding any pickup’s likely contribution to your tone. Consider this example: when Gibson president Ted McCarty tasked engineer Seth Lover with creating a brighter, clearer sounding pickup in the mid ’50s, Lover took the basic structure of the existing P-90 (which has two bar magnets beneath the coil) and replaced the steel pole pieces running through that pickup’s coil with sections of Alnico bar magnet. Viola! The Alnico V or “staple top” pickup was born—and a clear, sweet-sounding single-coil it is. The rule of thumb given to newbs is generally that “humbuckers are hotter than single-coil pickups,” but while that might sometimes prove accurate, it isn’t always true, by any means. There are many single-coil pickups—Gibson’s P-90 among them—that will drive your amp just as hard as a conventional or vintage-style humbucker. When Seth Lover and Walter Fuller developed Gibson’s “PAF” humbucker in the mid 1950s (the model for virtually all full-sized humbuckers that have followed), they essentially just divided the ingredients of the existing P-90 single-coil pickup between two narrower coils in their new double-coil design. Each of these pickups, therefore, has approximately 10,000 turns of 42-gauge wire in total, it’s just split between two coils in the humbucker, and pickups of the same eras used similar Alnico bar magnets (although the P-90 carried two to the humbucker’s one). Think of it like this: the narrower the window that senses string vibration, the tighter and brighter a pickup’s tone (or, more accurately perhaps, the tighter and brighter the tone it elicits from whatever guitar it’s installed on). A wider pickup, therefore, such as a full-sized humbucker, will generally capture a somewhat warmer, richer sound than a narrower mini-humbucker or a single-coil design. Taken further, a relatively wide single-coil like a P-90 will tend to sound warmer and richer than a narrower single-coil, like a ’60s Melody Maker pickup. Again, this isn’t a better-or-worse scenario, it’s just another means of predicting what you’ll get from different pickup types. And as with most of the above, the caveat “all things being equal” also applies; other aspects of any two pickups’ relative construction might influence the narrower pickup toward being thicker and warmer and the wider one toward being brighter. 6 – The Closer to the Strings, the Better They’ll Sound… Not! humbuckers can be raised as close to the strings as they’ll go without actually being hit by their orbital vibration when strummed, but they often won’t sound their best that way. Too close to the strings, many pickups will start to get a little harsh, ratty and choked sounding, even if they do sound “hotter” in the process. Often, lowering them will actually open up the guitar’s voice. With pickups that have magnetic pole pieces, adjusting height too close to strings will actually impede the strings’ vibration, and therefore choke and distort your tone, or even pull the strings slightly out of tune, creating odd dissonant harmonics, or “ghost notes”. This happens when the magnets within the pickups’ coils “drag” on the strings, both damping their orbital vibration and pulling them out of true. The single row of adjustable threaded-steel poles in the traditional full-sized humbucker is often viewed as a means of adjusting string-to-string output balance, but with a little lateral thinking they can be used for significant tonal adjustments, too. To prep yourself for this tip, first, think of each individual coil in the humbucker as its own single-coil pickup; then consider that the sound that any individual pickup “picks up” from the strings is greatly influenced by its positioning between bridge and neck: closer to the bridge is brighter and sharper, closer to the neck is warmer and rounder. Since each humbucker has two coils, their resultant voice is a blend of the position of these two coils. Now, note that the traditional Gibson neck-position humbucker has its adjustable poles nearest the end of the fingerboard, while the bridge-position humbucker its adjustable poles nearest the bridge. To make the bridge pickup a little warmer, lower the adjustable poles further into the coil, and raise the entire pickup closer to the strings so that the coil further from the bridge (the one with the fixed “slug” poles) is relatively closer to the strings than it was previously, and therefore relatively louder in the dual-coil blend. To make the neck pickup a little clearer and sharper, do the same; or, for the reverse of each of these scenarios, raise the adjustable poles and lower the pickup further into the body. You can play with the balance of these variables to fine-tune your tone from each pickup. 8 – Help, My Pickups Are Squealing! When faced with a pickup that squeals with unwanted microphonic feedback (as opposed than the musical, harmonic feedback that you can bend to your creative bidding) many players assume that they need to have that pickup’s coils potted, that is, dipped in hot wax or paraffin to seal any gaps or looseness in the winds of thin coil wire, which might cause unwanted feedback howl at high volumes. Often, though, it isn’t the coils that are squealing, but the high-frequency vibration of any metal parts such as covers or bass plates that might start vibrating when you’re cranked up. First, making sure any baseplates are screwed tightly to the pickup’s bottom. Second, remove any metal cover and drip a little hot wax over the top of the coil before quickly replacing the cover, pressing it down to spread the wax between cover and coils, thereby creating an insulating layer that will dampen unwanted oscillation. I have done this with several types of pickups, from full-size PAF style humbuckers, to Firebird-style mini-humbuckers, to old “gold foil” pickups on budget guitars, with great success on the vast majority of occasions. On the occasions where this doesn’t do the trick, yeah, the pickup might just need re-potting after all. Keeping your guitar clean and polished not only helps to keep it looking its best and to preserve its finish in the process, but the practice can also often make any guitar easier to play, by removing the gunk that gums up your fretting hand and impedes hardware. 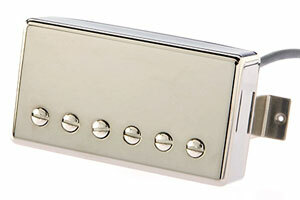 What you don’t want to do as part of that polishing process, though, is get any polish into your pickups. Stray liquid of any kind, polish included, will seep into the coils and eventually cause shorts and malfunction. When applying polish to your guitar, first cover the pickups with a dry cloth to prevent any excess from getting in, and keep them protected until you’ve buffed away any residue from the body. If you need to shine up the pickups themselves, buff them gently with a dry, lint-free cloth. 10 – Flop Sweats? Wipe ’em Down! Following on from #9, if you sweat a lot while playing, keep a hand towel nearby to wipe the top of your guitar and the mounting rings and pickups to keep that acidic moisture from getting into the coils. Several years ago I interviewed Rocket From The Crypt guitarist ND (Andy Stamets), and he talked about having to replace the pickups on his Les Paul Custom two or three times during the course of a tour due to this factor. Some players sweat, some don’t; if you do, you’ll want to keep that stuff out of your pickups.